Just returned from your New York City vacation? Sit down and plan your NYC vacation scrapbooking layouts with the help of the ideas and supplies you will find here. Who goes to New York and doesn't see the Statue of Liberty? Nobody! 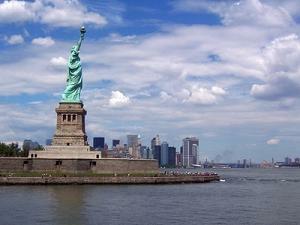 My suggestion would be to select a picture of you and your group with the Statue of Liberty in the background. Mat this picture on a red, white, or blue cardstock and then paste it onto a patriotic background paper . Save that Playbill! Use a background paper that will match the Broadway show's color theme. My suggestion would be to either cut off and use only the front cover of your Playbill or adhere the entire Playbill with the pages taped together. Find a font that matches the "attitude" of the font used on the Playbill for any title you create for your page. Use my computer font technique for a free and easy way to create that perfect title! If you stopped to get the actors and actresses signatures, be sure to crop and mat them on this page, too! Did you enjoy a Yankees, Knicks or Ducks game while you were in the city? Use team color background paper with these sport themed ideas. Crop a picture of you and your companions on or by the famous red, double-decker tour bus. You may also want to post a small map of NYC highlighting your tour bus' route. On a plain cardstock paper try randomly printing the names of the sights you saw on the tour, such as Central Park, Ground Zero, the Statue of Liberty and the Brooklyn Bridge. If you enjoyed a day at the zoo. Find fantastic ideas on this zoo vacation page. Find more ideas and supplies to make you NYC vacation scrapbook page perfect! Have You Created a Scrapbook Page of Your New York City Vacation? Share your NYC vacation scrapbook page with us! What is the title of your scrapbook page? Click the button and find the picture file on your computer. Then select it.